Just three weeks ago I was traipsing all over Washington, DC, breaking my own walking records. In all that time, over all those many miles, I got nary a blister and neither my feet nor my back complained. Over this last week, though, while merely chopping vegetables for dinner, an ache took over the joints of my feet and crept up into my back. By the time the recipe was simmering on the stove, I needed to sit down! 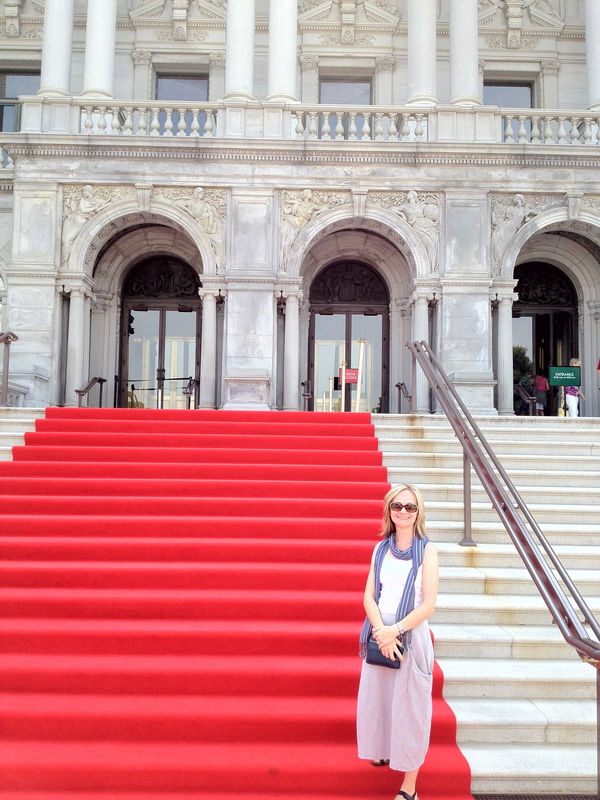 If you look closely, you can see the top straps of my Naot Kayla shoes, which I wore to walk the Red Carpet at the Library of Congress. How is it possible that one week I can tromp around a big city like a 20-year-old in sneakers, and just a few days later I’m like an 80-year-old grandma hunched over the kitchen stove? I can’t help but wonder if the difference had anything to do with the kind of shoes I wore. In the kitchen, I had on loafers–shoes that are cute and easy to get on and off, but which have little in the way of support. Alternatively, I didn’t go anywhere in DC without wearing a pair of Naot sandals, shoes I know to be lightweight and supportive for any test I put them through, even during a hot, sticky Mid-Atlantic summer. I don’t think this is just a coincidence and I’m pretty sure Steve Lax, President of Yaleet, Inc., the U.S. distributor of Naot Footwear, would agree with me. Naots, he said, start out comfortable and get more comfortable over time. Whether I’m trekking miles over historical brick sidewalks in DC, or hovering over a stovetop in Michigan, my feet and back stay pain free. She bought two pairs–one to wear right then and one to wear when the other one wore out, in case the style was discontinued. I also have two pair of Naot shoes–the Kayla style, which I deemed the perfect summer travel shoe in a previous article, and a new pair, the Esteems, which I wear for fancier occasions. Naot Kaylas — the perfect summer travel shoe. Back in the late eighties, when Naot started developing their shoe line, the only comfort shoes out there were made in Europe. Those shoes had a break-in period and the soles only lasted a couple of months. Plus, there was basically only one style–wide and clunky. In Israel, where Naot shoes are made, people wear sandals 12 months of the year. A shoe that had to be broken in and whose sole lasted only two months wasn’t practical. So, the developers got to work and designed a shoe that was comfortable from the very beginning–that’s where the cork and latex insole comes in. They also used a supportive, long-lasting polyurethane bottom sole, as well as soft European leathers which prevent blisters. Naot shoes started out comfortable and got even more comfortable as a person wore it, plus it had a sole that could last. “It’s like the difference between the Model T engine and the jet engine,” said Mr. Lax. Even the heels are built to overcome the issues of comfort and clunkiness. 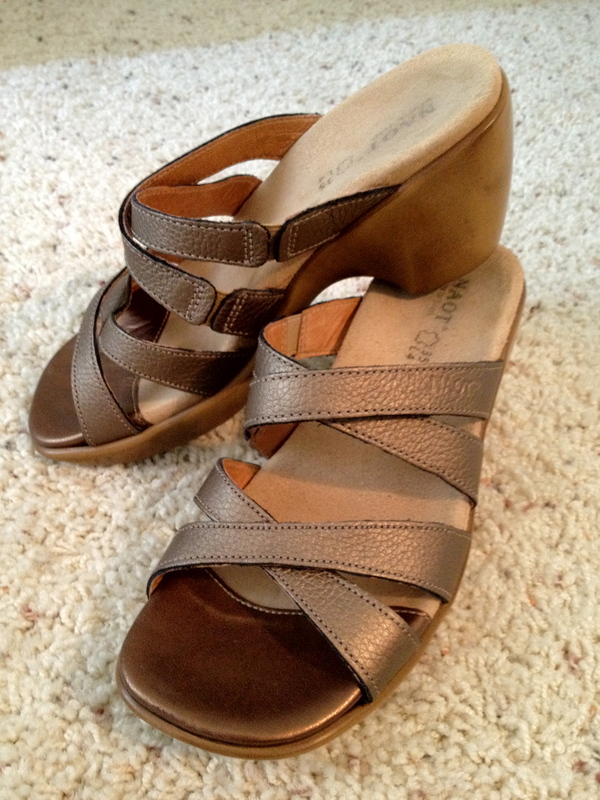 “Our heels and wedges are angled to be a zero heel. No pressure is placed on the back.” No wonder I could walk a mile and a half to dinner and back in DC wearing my Naot Esteem shoes without feeling like I was walking in a heel. Naot Esteem in Platinum Leather. These same in-house designers set the standard for removable, insertable orthotics. “Thirty percent of national labs are using our insole,” he said. What that means is, if you use an insertable orthotic, there’s a good chance it was designed by Naot’s designers. Over the years, new styles have been added to Naot’s lineup of sandals, shoes, and boots, but they all must meet the standards set by the organization, standards that are shaped with a vision toward making the world a little better everyday. “It’s not all about money,” said Mr. Lax. “We are a very socially active company. We donate Naot shoes to shelters all over the country.” In fact, just the week before I spoke to him, he said they gave away 200 pairs of shoes at a shelter in New York City, and they have similar events on a regular basis in shelters nationwide. So, now I know. When I’m traveling the globe, wearing my Naot shoes, my feet are held in consistent comfort and support because of a dedication to quality that runs deep within the company. It’s that attention to quality that not only makes my feet happy, but now it makes my heart beat a little happier, knowing I’m supporting a company that supports the community at large in such big ways. Thank you, Mr. Lax, for your time and your company’s generosity. Over the past couple of months I have “discovered” Naots. I found a fabulous pair of short boots that feel wonderful, a beautiful pair of light purple sandals and a pair of shoes that feel like they were custom made for me. Naot shoe designs have come a long way since I first saw them. Years ago I think they were very similar to Birkenstocks in appearance but now they have huge variety. 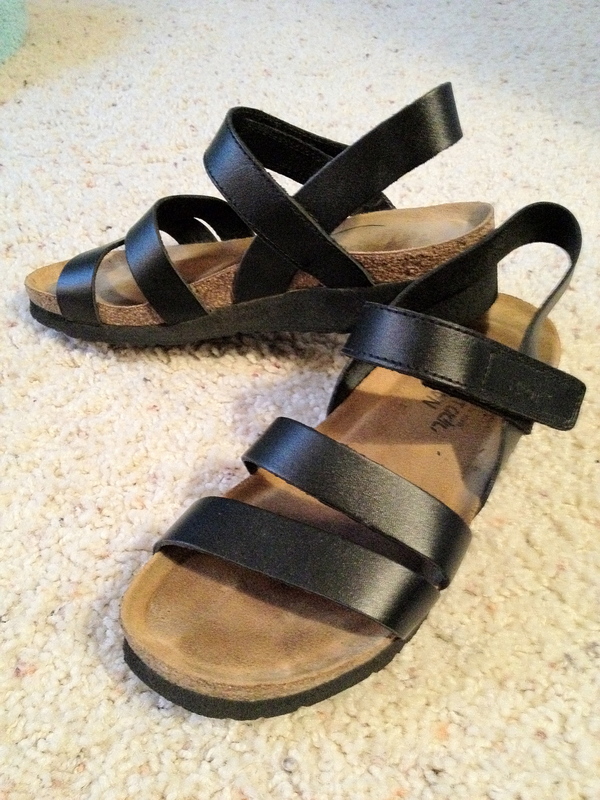 (Birkenstocks have improved their selection as well, but my vote goes to Naot.) I like both the models you have. Isn’t it great to have comfort and good looks? Until recently I didn’t even know they did boots! When I bought mine they were the last pair in the store – and in my size! Same thing this past week-end when I bought the shoes while on holidays – last pair – my size. What does that tell you? Now I’ll be on the look-out for new arrivals!